The long wait is over. The day has finally come. 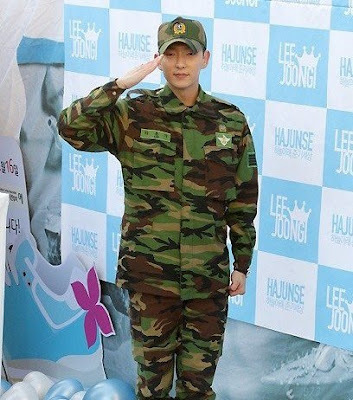 At about 8am (time in Seoul) today, Lee Jun Ki has finally been discharged from the military. He was greeted by fans, who eagerly waited for him outside the military station. "I am reporting. Lee Jun Ki is now being discharged from the military. Loyalty!" was his greeting to fans and well-wishers. “I was happy and gained strength from all of the attention when I entered the military. Thank you for coming to my being discharged from the military. I will try my best." Later today, Lee Jun Ki will have a fan meeting at Seoul Sang Myung University Art Center. Dubbed as "Reunion JG", a total of 1,500 fans are expected to be in attendance. This will be his first in his lineup of comeback activities. I can just imagine how thrilled the fans are to see the kkonminam back. If I could, I would have come to Seoul to personally see him and welcome him back. But of course, that's just wishful thinking. For now. I'll be keeping my eyes peeled for Jun Ki's future activities. I hope he gets note-worthy projects that are deserving of his exceptional talent. Oh, and in case you didn't know, his album 'Deucer' will be coming out next month. I'm grabbing a copy of that as soon as it hits the record bars in Korea and Japan. Sharing my happiness on Happiness Is and 366. Rona here from Happiness is. Nawala na ako sa Korean entertainment, nung andyan pa ako sa Pinas, panay din panood ko ng Korean series. Aneong! My Happiness.. Color Connection is also open, so come and join when you get a chance. Have a great weekend! Ang dami namng napaligaya ni Lee Jun Ki at isa ka na dun! I do not know him Sis but sounds like you are a die hard fan of him :-) Visiting from my 1st Happiness Is entry, hope that you can return the visit too. He is a cutie Sis :-)Visiting from my 2nd Happiness Is entry, hope that you can return the visit too. Visiting from my 3rd Happiness Is entry, hope that you can return the visit too. Visiting from my 4th Happiness Is entry, hope that you can return the visit too.